This post is by MSU postdoc Joel Slade. 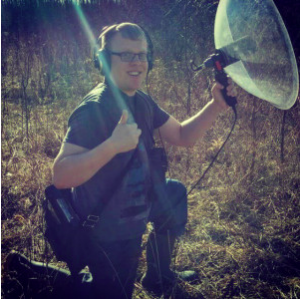 Joel recording bird song in 2014. “BEEP! BEEP! BEEP!” – I wake up to the dreaded sound of my alarm clock at 3:45 am in my cabin. Even though it’s mid-April at the Queen’s University Biological Station in Elgin Ontario, the chilly air still penetrates my bones as I rapidly put on my warm field gear and grab my flashlight to meet the field team. In the back of our field vehicle are two parabolic microphones, and kits to collect blood, take body measurements, and band our study species, the song sparrow (Melospiza melodia). This relatively plain looking songbird has been the main model species for the MacDougall-Shackleton lab in the biology department at Western University in London, Ontario (where I completed my PhD). However, where this bird is lacking in coloration, it makes up for in melodic beauty. Male song sparrows are one of the first songbird species to arrive to their breeding ground at our field site around late March/early April to stake out their territory. When you arrive early in the morning all you can hear are males defending their territory and trying to attract females that are slowly arriving. However, not all males are of equal acoustic quality, and this may be determined by a family of genes called the major histocompatibility complex (hereafter, MHC). Listen to one of Joel’s recorded song sparrows Photo Credit: Tosha Kelly. In jawed vertebrates, MHC genes produce cell-surface proteins that recognize pathogen-derived antigens, which are presented to T cells to initiate an adaptive immune response. What’s fascinating about MHC is its incredible genetic diversity. The MHC is one of the most polymorphic gene families in existence, whereby many species contain multiple alleles. 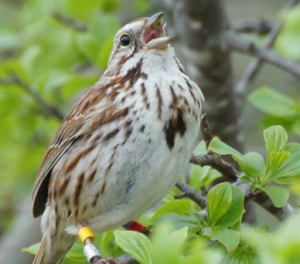 For example, in my PhD study species, the song sparrow, we characterized up to 26 MHC alleles per individual, and 517 different alleles across the population. It is posited that pathogen-mediated balancing selection is responsible for this immense diversity at MHC in many animals. For example, risk of disease by multiple pathogens should favor heterozygosity at MHC loci. Likewise, antagonistic coevolution (host-pathogen arms races) should generate new MHC alleles. So, there is no doubt that expressing a wide-variety of MHC molecules should confer fitness benefits, but could being too diverse be a bad thing? Juvenile male song sparrows experience a critical learning period during their first year of development. Within this critical period, males will listen to the songs of local males and create their own song types. After a year, males are no longer capable of learning new songs. Therefore, their condition in early life is critical for them to increase their song repertoire size. Males range from singing as little as five song types and as much as 12 song types. Females are more likely to choose males with more song types, as it is considered an honest signal of quality. Since MHC diversity is critical for the adaptive immune health of vertebrates, I postulated that MHC diversity of male song sparrows is related to their song repertoire size. I predicted that males with high diversity could fight off more pathogens while learning songs in early life, and therefore would be able to invest more energy into song learning instead of immune defense. When I compared song repertoire size to MHC diversity, I found that MHC diversity is related to song diversity, but in a direction that I did not anticipate. It was males with intermediate MHC diversity that sang the most amount of songs, rather than males that were maximally-diverse at MHC. This created a non-linear (quadratic) trend whereby males with low and high MHC diversity sang the least amount of song types (Figure 1). What may explain this trend? Apparently maximal MHC diversity may be bad for your health. Two main hypotheses exist to explain this phenomenon: (1) too many MHC alleles may cause autoimmune disorders whereby MHC proteins start recognizing self-antigens as non-self antigens, and (2) too many MHC alleles expressed may cause a dilution effect whereby the most important MHC alleles required to recognize a pathogen are not in high abundance, and therefore you may not be able to recognize the invading pathogen. My study is not the first to discover an intermediate MHC diversity advantage. 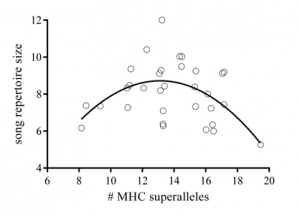 In fact, in three-spined sticklebacks (Gasterosteus aculeatus), individuals with intermediate MHC diversity had the lowest parasite loads than those that had low or high levels of MHC alleles (Wegner et al. 2003). My study may therefore reflect a balance between pathogen-mediated selection and selection against maximal MHC diversity, which is critical for song learning in these sparrows. At BEACON, I am bringing my expertise on avian immune genes by working with Dr. Danielle Whittaker and Dr. Kevin Theis. We are exploring how host immune genotype can shape their microbiome, and thus shape the semiochemicals produced by commensal bacteria. This blog post is based on Slade et al.’s (2017) study in Biology Letters. Wegner KM, Kalbe M, Kurtz J, Reusch TBH, Milinski M. 2003 Parasite selection for immunogenetic optimality. Science 301, 1343. This entry was posted in BEACON Researchers at Work, Notes from the Field and tagged animal behavior, BEACON Researchers at Work, Biological Evolution, communication, Field Biology, fitness, mate choice, MHC, sexual selection. Bookmark the permalink.